There is a popular legend on the origins of the falls. There once lived a nymph called Nera who fell in love with a handsome shepherd named Velino. There love was undeniably strong and this angered the goddess Juno. She became so jealous that she transformed the beautiful nymph into a river that bears her name. The love struck Velino did not want to lose his beloved and jumped off the Marmore cliff into the Nera river to be with her forever. 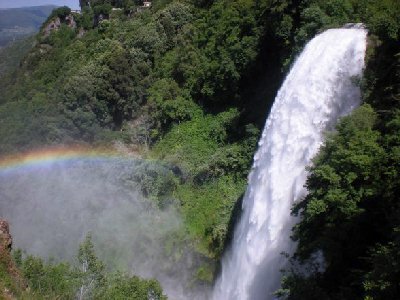 Thus the falls were created as a lasting memory of Nera and Velino's love for each other. Who knows maybe the rainbow that can be seen when the falls are fully operational is just another sign of their undying love for each other. If you visit the falls with children you may want to go visit the elf Gnefro. Gnefro will take you an "Enchanted Walk" that will captivate the children as he recounts the legend of Nera and Velino. Photo by Marmorefalls.it. Used by permission.